When I was a kid we'd have squash boiled with butter. I guess I should say my parents ate it while I made fun of it. With a few more years under my belt, I'm finding that zucchini is actually pretty tasty! 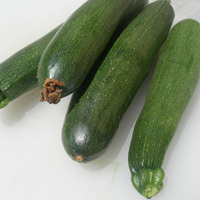 I like to plant one zucchini plant in my garden each summer, and that will yield dozens befor the end of the season. Before the summer is over I will fry, roast, stuff, and even boil my many zucchinis and love every minute of it. 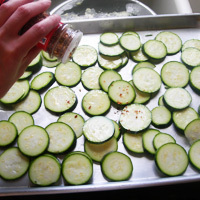 Below is some helpful information on zucchini followed by several recipes to get you started on your own produce boon. Selecting- choose one that is firm, slender, smooth and with a bright color. 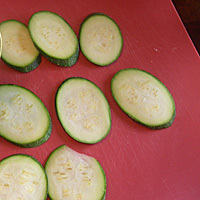 Once the fruit matures, the taste is not as sweet, so choose smaller zucchinis with the flower still attached. Storage- Store for three days to one week in the refrigerator. garlic, and parmesan cheese. 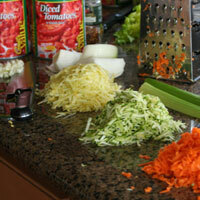 Grate zucchini for use in tomato sauces or breads.